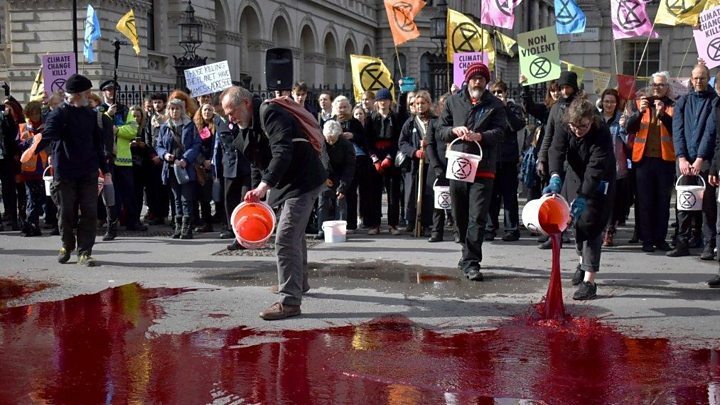 Protest group Extinction Rebellion's fight against climate change is making headlines - most recently when they stripped almost naked in the House of Commons. The Victoria Derbyshire programme went behind the scenes with the group, which urges people to break the law to save the world. "Troublemakers change the world," says Roger Hallam, one the group's founders. "When they're starting to call you troublemakers, you're starting to get some traction, right?" Mr Hallam is unrepentant: "If you're a trade union, everyone knows that when you first go on strike everyone's going, 'Troublemakers.' But then you have to state your case, which is, 'If you don't get this sorted, we're going to die.'" We filmed members as they blocked traffic in central London - playing cat and mouse with the police - and as young members glued themselves to the entrance of a fracking conference. "Mass participation and civil disobedience maximise the chance of social change in this context," he explains. "It doesn't mean it's guaranteed, it just means it's massively more likely to be effective than sending emails and doing conventional campaigning. And it's significantly more effective than using violence." "The police will go to government and say, 'We're not doing it anymore,'" says Mr Hallam. "They're not there to start arresting 84-year-old grannies or 10-year-old kids, there has to be a political solution." The group's headquarters is in a slightly unexpected spot, the top of a corporate building in Euston which also houses a construction company and a fashion brand. It was given to them after one of their members approached a corporate landlord and said: "We're not going to be around in 10 years, let us do something about it." He gave it to them, in effect, for free. At a training event for new joiners, a debate is held on what counts as violence - Extinction Rebellion is a non-violent organisation. In a role-play exercise, they learn how to deal with angry members of the public - the people they are often obstructing during protests. They are also taught what to do when they are arrested - how to make it more difficult for police to pick them up and their legal rights once they get to the police station. The Taxpayers' Alliance, which campaigns for lower taxes, says their behaviour is "clearly irresponsible and wasting police time". The group's chief executive John O'Connell said: "They should stop these juvenile actions and express themselves peaceably, and not resort to playground politics." Does Extinction Rebellion really think ruining people's day by blocking their way is going to change their minds? "Yes, it is," says Mr Hallam. "The only way people change is by getting upset. No change is possible unless there's major emotional distress. And you can do that violently and non-violently... it's a no-brainer, that's how society changes." "I don't want to be standing here, six months pregnant, breaking the law," she tells the crowd. "I don't want to spend my weekend in a police cell, and I don't want to be giving more work to our overstretched and undervalued police force. But I don't feel like I have any other options." In fact, there are no arrests during this demonstration - the police do not always give the group the results it hopes. "The whole point is to get arrested - I've come from Manchester to get arrested," says one disappointed man. But there are journalists everywhere which is also what the group wants - the press covering them and telling people they exist. Later this month, the group plans to blockade London in its biggest action yet - it says its members will sit in the streets until politicians listen. She explains: "I've got four kids and the eldest one, every year she gets older and I feel, 'Where's the progress?' All that time I spent as a lawyer and a professional away from her, what does that count for?"